You may have noticed I have reviewed plenty of air compressors on my website in the hope you find one that suits your needs. Some units you come across may seem like the obvious choice however, I take pleasure in finding that hidden gem, and that’s why I’ve decided to include one by Rolair Compressors. The company is hardly new since they’ve been in the business for over 45 years. Their compressors are known for being reliable and well-made which is not a surprise because each compressor undergoes some serious testing and quality control checks before it gets released onto the market. The one I’ve chosen to tell you about is aimed at professional contractors and goes by the following name: The Rolair FC2002 2 HP Twin Stack Compressor with Manual Reset and Overload Protection. Another name that just rolls off the tongue! This compressor delivers 4.1 CFM of compressed air at 90 PSI for continuous operation, and maxes out at 125 PSI. The motor packs a serious punch, producing 2.0 hp. As is the case with most professional compressor units, this one also has an oil-lubricated pump which helps prolong its life. It has 4.3 gallon dual tanks in a twin-stack configuration in case you need that extra bit of pressure. The whole device is extremely sturdy which is not surprising since it is made out of cast iron. This compressor is a true workhorse. My bad, they actually named it “The Bull” which is very appropriate. I’ve already told you the performance figures which are more than suitable for any kind of air tool including nail guns, paint sprayers, air cleaners and so on. Also, it has a 100% duty cycle which basically means it is able to work non-stop. No more recovery time needed! The air compressor has an oil-based pump which requires very little maintenance. It comes with built-in overload protection and a manual rest option. This type of pump is more durable than its oil-free cousin, and the pump on this particular model has industrial-grade ball bearings to make sure the compressor keeps on working for a long time, as well as reed valves which are made out of stainless steel. Producing about 80dB, the Rolair FC2002 is fairly quiet, so it won’t make your head explode as you’re using it. There are definitely quieter units out there (such as the Senco PC1010), but this is still one of the less noisy compressor’s in its class. If you plan on using it indoors or in a basement, you can do so without fear that your neighbors will call the police on you! Weighing 62lbs, this unit is fairly portable considering it’s a compressor that’s designed for use on heavy-duty jobs. I would like to have seen some wheels on it, but it does come with a carrying handle. On the plus side, the weight of the compressor is evenly balanced which helps with transportation. The manufacturer’s attention to detail on this compressor is amazing. Everything is incredibly well-made, and there are some small but nice features. One I particularly like is the copper tubing which is excellent because copper helps heat dissipate quicker. Another thing I like is this unit is capable of starting up in cold weather even without circuit breakers. I’ve found this unit to be sturdy, extremely well-made and durable, so you won’t be looking to replace it anytime soon. 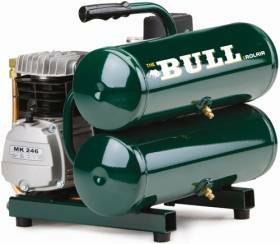 Capable of handling small and medium jobs, I think it’s one of the best twin-tank hot dog compressors on the market today. Portability is ok thanks to a carrying handle, and it doesn’t weigh a lot considering how sturdy it is. It’s made out of cast iron for crying out loud! It is affordable to the point where it can give some of the more expensive and more powerful compressors out there a run for their money. Rolair has a great reputation for making extremely well-made equipment, so if this compressor meets your demands I don’t think you can go far wrong with it. If you’re interested, the best place to find one is definitely Amazon since they always have some sort of discount on air compressors.